Critiquing video game outfits, one belt at a time. 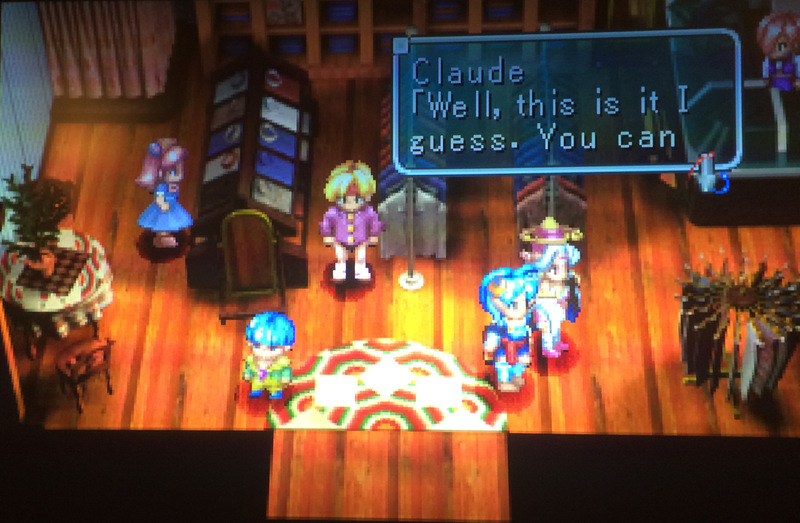 My replay of Star Ocean: The Second Story continues this week, and I’ve just made it to the Lacour continent. This means taking a roundabout trip through the port city of Clik in an attempt to charter a ship and, while waiting for that ship to board, being shown around town by a young rich kid named Ketil. Ketil’s idea of fun is stealing your wallet and then dressing you up in ridiculous outfits for his own amusement. 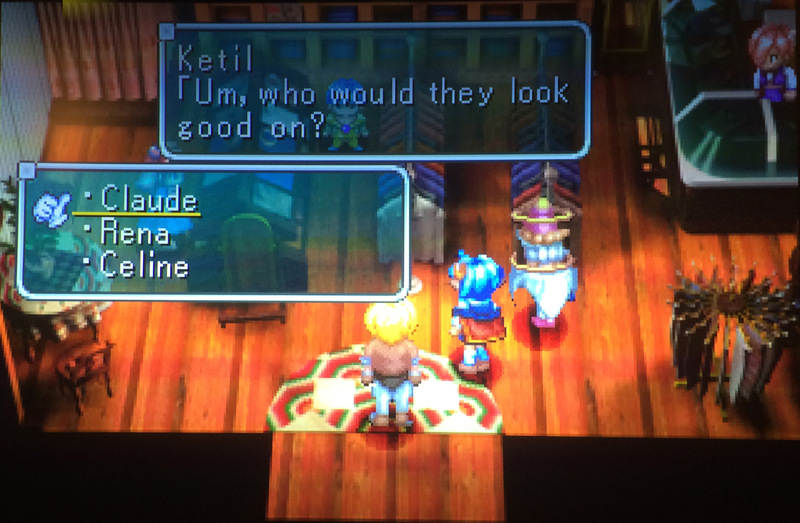 At this point in the game, you can only have three characters–Claude, Rena, and Celine–and Ketil selects a different outfit for each depending on whom you choose to humiliate. This is, so far as I can remember, the only time in the game we see any characters wearing different clothing. So let’s compare Ketil’s fashion picks and decide if anyone can be considered the winner. 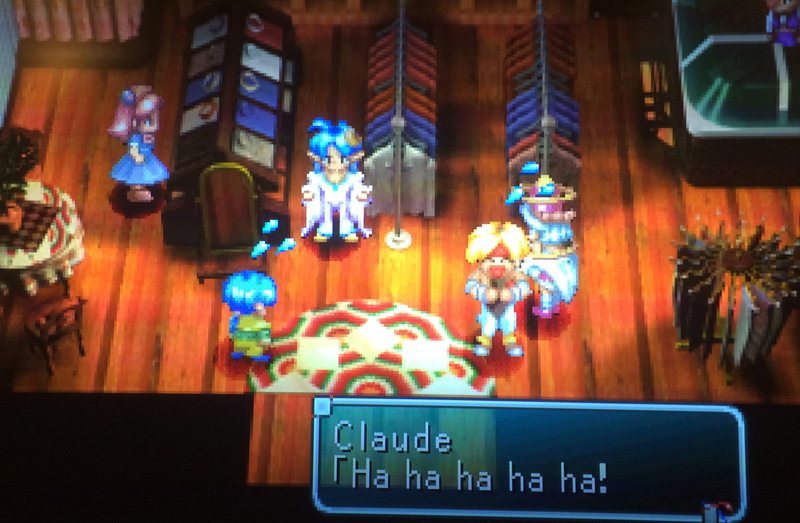 For Claude, Ketil appears to have picked the top half of a clown suit and a pair of black bikini bottoms. 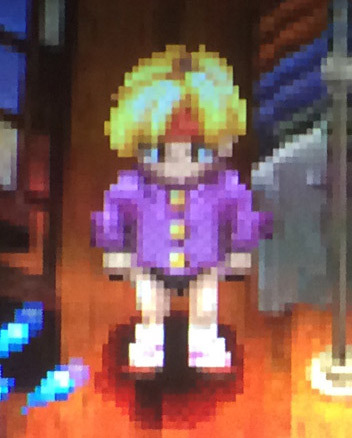 The purple top isn’t a terrible choice with Claude’s blonde hair and fair complexion, but the oversized yellow buttons and complete lack of pants scream “a five year old dressed me today.” He also appears to have some layered slouch socks which, while at least providing some warmth to his lower half, turn the ensemble into bargain bin workout instructor. Not appropriate for saving the world or leaving the house. 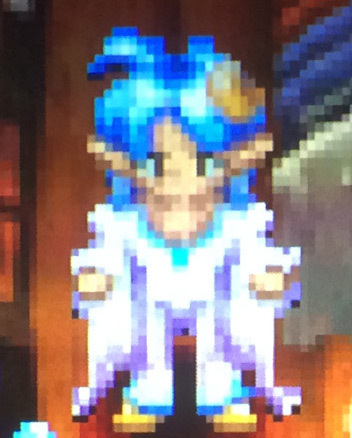 From a distance, Rena’s ensemble appears to be a simple white mage robe with blue detailing to match her hair. 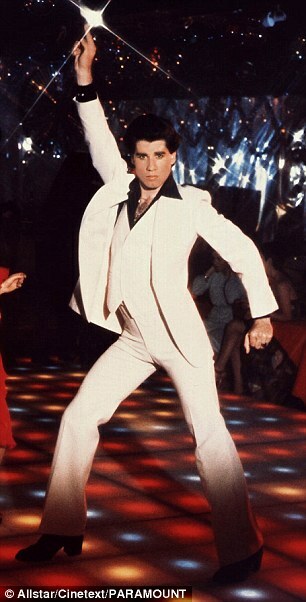 Upon closer inspection, however, the main portion is definitely a jumpsuit with flared bell bottom pants. Thanks to the controlled v-neck, it’s slightly more John Travolta from Saturday Night Fever than 1970s Elvis, but the line of separation is razor thin. 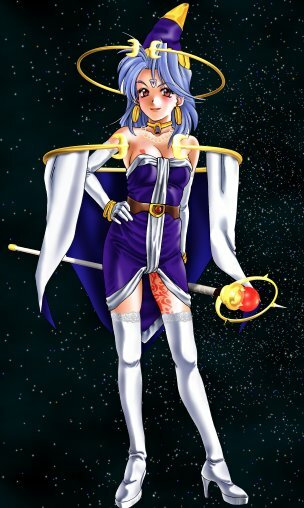 This outfit at least looks wearable, if not a blast from the past of a planet Rena has never even heard of. I’m suspicious that Celine’s outfit isn’t made of actual clothes, but the receipt tape from the store’s cash register. This appears to just be a long piece of string that Celine has wrapped around herself in Eve fig leaf fashion, although there’s about five feet of leftover string trailing the ground like a pet snake. 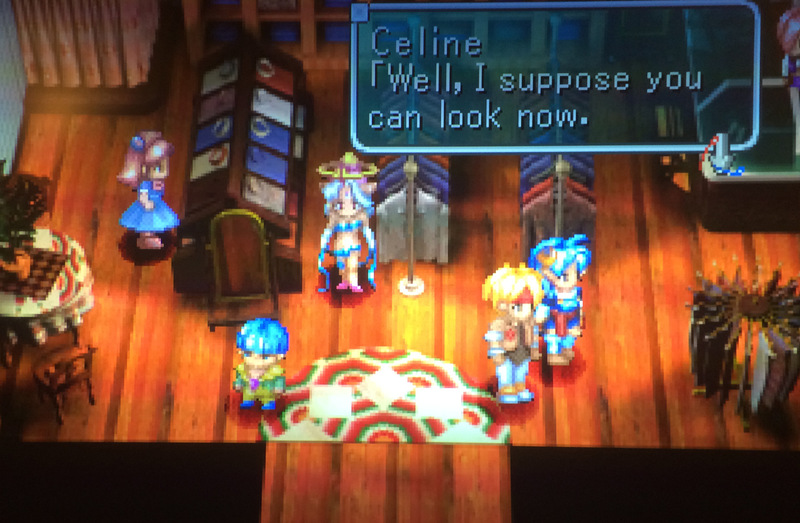 This is somewhat fitting, as Celine is the most sexily dressed character normally, with her Heraldic crest tattoo peeking out from her upper inner thigh. 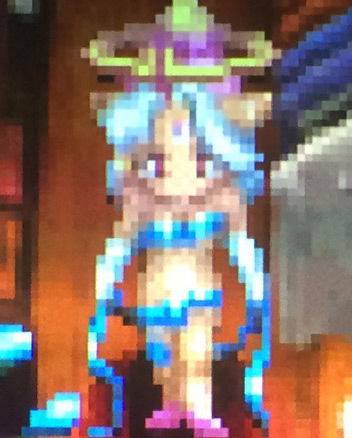 But this ribbon bikini is even less practical than Claude’s pantsless disaster, threatening to fall off in the slightest breeze and trip her if she takes a single step. Honestly, this is the only outfit that could actually withstand the world-spanning adventure our crew is on. Fashion-wise, it at least has some basis in history, even if it’s ’70s jumpsuit history. The real lesson here is: never let a kid with a blue rattail dress you. This entry was posted in Fashion, Video Games, Who Wore It Best? 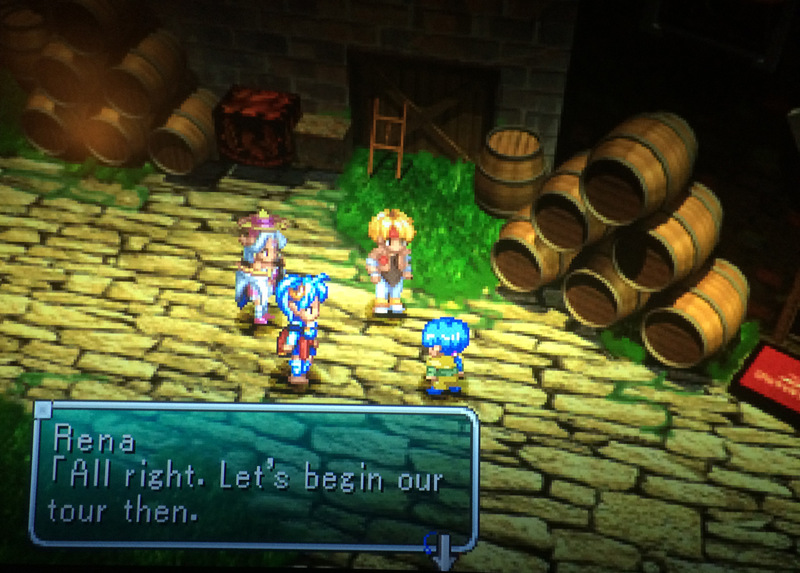 and tagged Star Ocean: The Second Story. Bookmark the permalink.